Anyone who has visited the Southwest Porch at Bryant Park can attest that Southwest Airlines’ reputation for hospitality and service is well-earned. The airline has assiduously cultivated this reputation so that people who may not even fly know that Southwest means quality service. 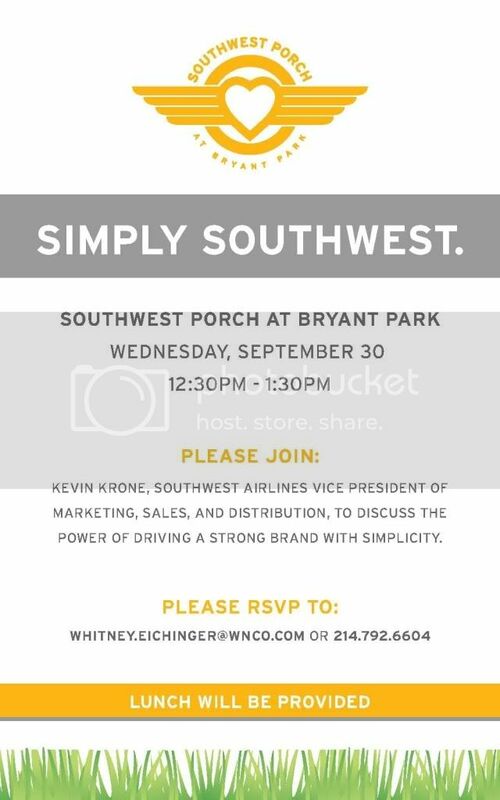 For those interested in such effective brand-building, Southwest Airlines and Bryant Park invite you to the Southwest Porch at 12:30-1:30pm, Wednesday, September 30, for lunch with Kevin Krone, Southwest’s Vice President for Marketing Sales and Distribution. Mr. Krone will discuss the power of building a strong brand with simplicity. Seats are limited, so please RSVP to: Whitney Eichinger at whitney.eichinger@wnco.com, or call her at 214-792-6604.